Hattie Peck adores eggs of all kinds. But now it’s time. They all need to leave her big loving nest. 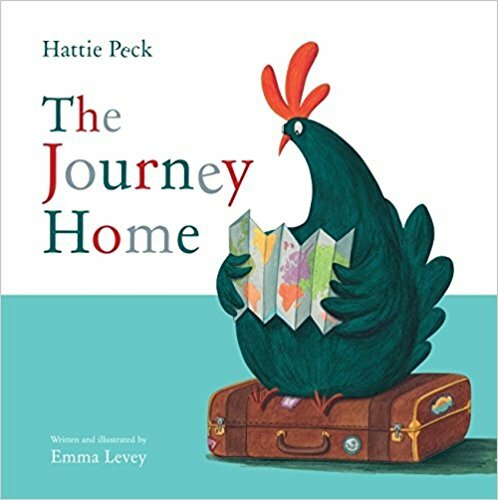 In this second book about Hattie Peck, the chicken who can make her own eggs, so she collects them from all over the world to hatch and raise a blended family of all types of animals, is taken to another level. Hattie’s brood of cockatoos, storks, owls, and reptiles is getting older and ready to leave Hattie’s nest. Her big old loving nest is soon to be bare and Hattie’s heart is sad even if she knows it is the best for her children. This is a lovely and poignant book about family and differences, that also speaks to parents about how they must let go and make hard decisions. However, like the first Hattie Peck book, there is a surprise twist of an ending that is sure to bring a smile to everyone’s face. This book includes bright and lively illustrations and lots of information about egg-bearing animals that makes it quite educational. About the Author: Emma Levey works in everything from print and gouache, to photography and 3-D. Emma is based in a teeny, tiny village called Llancarfan, in the south of Wales.